I’m a huge fan of Game of Thrones. I started with the HBO series, and continued with the books by George R.R. Martin. (I’ll do my best not to put spoilers in this blogpost for those who still have to discover the series or the books). 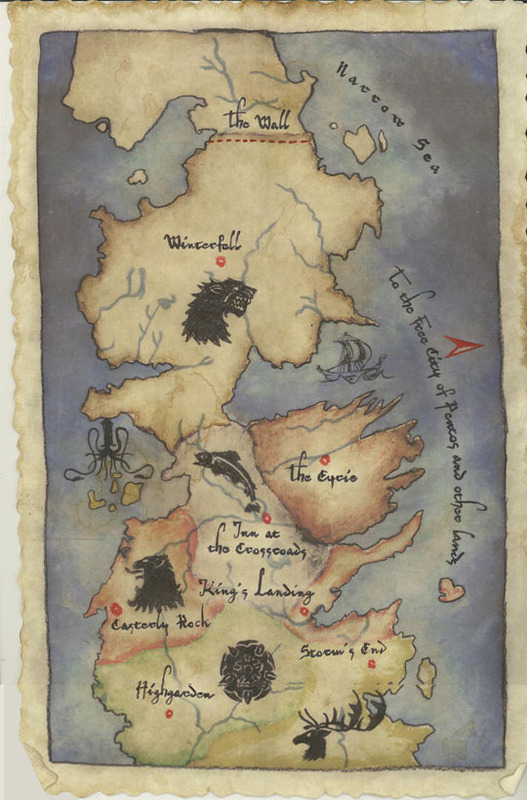 Game of Thrones is the first book in the series of novels “A Song of Ice and Fire“. Central is the clash of seven kingdoms on the fictional content Westeros. The seven kingdoms are protected by a wall of ice in the North, guarding the realm from the Others. Nobody really knows who they are, but the wall has been there for thousands of years, and it’s certain they will come back some day. The wall is guarded by the Sworn Brotherhood of the Night’s Watch. The task of these sentinels is to protect the realm against the Others, and guard the wall so the kingdoms are kept safe from wildling raiders. They’re not linked to one of the kingdoms in particular, and are a-political in a certain sense. The Brothers of the Watch vow to never hold land and titles, never take a wife, never father children, cut ties to their families, take no part in the quarrels of the kingdom, and live and die at their post. It’s interesting to notice that these vows can be read almost integrally as the manifesto for a good project manager. Needless to say that a project manager always works in the dark, giving all the sunshine to his customer or his business owner. Either you are a project manager, or you’re not. Experience has a lot to do with it, but you can’t make a stamp out of a newspaper (© Jos Doucet). This is perhaps a little exaggerated. If you’re a project manager, don’t hope you’ll be on every award stage. It won’t happen that easy. A project manager is like a goalkeeper. When you win, you did your job. When you loose, the goalkeeper is the center of blame. Here I disagree. A good project manager goes home at a reasonable hour. Don’t forget you’re no hero. When everybody is losing it, it’s your task to calm them down. Keep calm and carry on. Look for solutions, instead of getting stuck on problems and laying blame. It’s important as a project manager that you’re constantly vigilant for potential issues. An issue only becomes a major issue if you wait to long. When you act right away as it’s showing up, it will stay only a minor thing. This summarizes it pretty well. You have to be aware of your role and how you manage your team. Be open in your communication, and wake the sleepers at all time. I pledge my life and honor to the Night’s Watch, for this night and all nights to come. Don’t be a project manager just because it seems to be a cool title. Be proud about the fact that you’re a linchpin in your organisation. Read more about leadership in this post on Christopher Avery’s Leadership Gift. Excellent analogy, I am huge fan of # gameofthrones too, your vows mapping was brilliant. Good stuff.